OAK LAWN, Ill. (WLS) -- Police in Oak Lawn, Ill., are searching for four suspects in connection to two separate robberies on Wednesday. 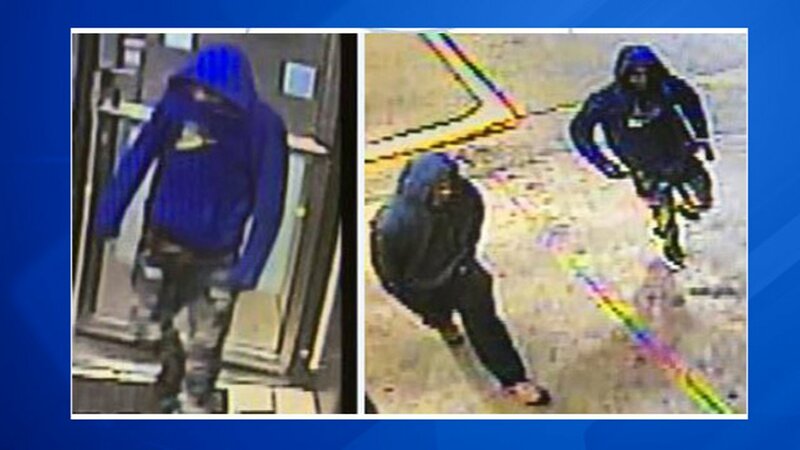 Police are looking for two suspects they said robbed a Mobile Gas Station in Oak Lawn Tuesday evening. Police responded to an armed robbery at the gas station on 103rd Street and Pulaski Road. Police said an investigation showed a black male entered the business, displayed a black handgun and demanded cash. The suspect then left the area, police said. Video from the business showed a second subject waiting outside the gas station as a lookout, police said. Police describe one of the subjects as 25-30 years old, about 5 feet, 5-10 inches tall, 150-175 pounds and was wearing a blue hoodie and partially bleached and tattered blue jeans. The other suspect is described as about 5 feet, 5-10 inches tall, 150-175 lbs. and was wearing a dark hoodie, blue jeans and tan shoes or boots. Oak Lawn police are also searching for two suspects they said robbed a Payless shoe store Wednesday evening. Police said a male, either of Middle Eastern or Hispanic decent, and a black female entered the Payless on the 6300-block of West 95th Street. Police said the two approached the counter and the male demanded cash from the register and threatened the clerk. The suspects then fled the area. No one was injured. The male suspect is described as 20-25 years old with short hair and a beard, 6 feet tall, 180-200 pounds and was wearing a grey hoodie and black gloves. The female is described as a 20-25 years old, 5 feet 2-5 inches, 125-145 pounds with shoulder length curly hair and was wearing a black hoodie, black leggings and black combat boots. Anyone with any information is asked to call Oak Lawn Police at 708-422-8292.